Keep your establishment organized in style with this 4-compartment black cutlery box! Made of sturdy polyethylene plastic, this box will provide a long serve life under normal use and wear. The black, high-gloss finish makes this organizer ideal for use in front- or back-of-the-house applications. This efficient design features 4 individual compartments, allowing you to neatly separate flatware, straws, and more for easy access by servers or patrons. In addition, this box includes molded handles to enable easy transport around your establishment for refilling self-serve stations or setting dining tables. For your convenience, this organizer is also easy to clean, and does not warp under hot water. Plus, the relatively small footprint is space-efficient, so it won't take up too much counter space. This 4-compartment cutlery box is perfect for all of your many organizational needs! These cutlery boxes are very rugged and can hold a lot of weight. They are great for keeping your silverware organized on your shelves. Easy to carry 2 or 3 of these stacked up without feeling like the box is going to give out from the weight. These are great. The will hold just about anything you need. I am really happy about the drain wholes in the bottom, Makes for less of a mess. The Cutlery box is as described. Durable and practical, versatile and a must have to any food service. I particularly like this one for its quality and craftsmanship. It is not cheaply made like some competitors. Great for organizing and storing utensils. They seem pretty durable and holding up to use so far. Easy to clean as well. Would recommend for any restaurant. Very economical way to organize/store flatware. Have purchased others from local supply house for much more before, and this one is equally as nice. Won’t be wasting money elsewhere again! These cutlery boxes are great for holding and organizing our silverware for the dining room. We have different colors to differentiate catering vs regular service silverware, and even to show polished vs not. This cutlery box is very durable. In our restaurant, we utilize them for several other tasks. We use one to store the drink cup lids on our self serve bar. 4 -comparement is much bigger?and good for fork?spoon?knife and napkin?All in one and easy to clean and take out?Also the quailty is very good ? Excellent silverware tray. It is quite large so check the dimensions before you buy. I was expecting something much smaller but it's my fault for not checking the size. If you want something large and sturdy this is it! Excellent product! I bought three of these things and they are very sturdy and very tough. They hold quite a bit of volume so we like them a lot. I absolutely love this product! I use this for not only mu cutlery but also for condiments and lids that go with my 8 oz. cups. Great Product! This is an essential great multi use item for our food truck . We use these on the table to hold napkins, spoons and small menu handouts. Nice thick cutlery box! This works great for storing silverware but this can also work great as a supply divider! Check out the photos and you can see how it can easily house school supplies! I like this because this product is affordable and solid. This is necessary stuff for restaurant so I bought this and this box looks exactly same as a photo on website. Excellent product for reasonable price. Shipping was less than 48 hours... extremely happy with silverware tubs and value. My customers love these tubs too. Thanks. We have been buying these for years. They are sturdy and hold up well. We recently purchased more flatware so we purchased more of these holders as well. These are great for polishing and sorting silverware. Having four compartments is perfect for all your silverware needs. Heavy duty plastic will ensure long lasting. This cutlery box is nice for keeping sorted silverware or rolled silverware in. I only gave it 2 stars because 1 out of the 2 I received came in completely cracked and pretty much useless. We appreciate your feedback! We’re sorry this is damaged. A Customer Solutions Representative will be contacting you soon. This cutlery box is heavy duty so it should last a while. It holds quite a bit of silverware which is a plus. The sticker was smack in the middle of it however, and was very hard to remove. These are really good. We use them for customers to get forks, knives, spoons, drink lids, straws, condiment cups, salt, pepper, etc. I bought a bunch so they can be filled in the kitchen and swapped out with the one in service. If you don't swap them out, eventually crud builds up from customers in the bins, so you can't just keep refilling the one out there without emptying it and cleaning it on a regular basis. 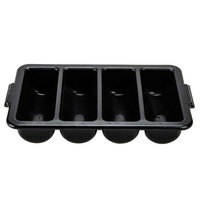 This four compartment plastic black cutlery box is a good way to organize and quickly access your utensils. The deep sections allow for considerable amounts of utensils to be stored at a time. These silverware trays are very durable even when loaded up with heavy silverware. The look great and have been easy to clean and do not scratch easily. This cutlery box is a must have for any bar or restaurant. This handy little box keeps you silverware organized and its short design allows it to fit in drawers or under counters. I am so glad I found a BLACK cutlery box for our coffee parlor. Our entire backbar is black, so this helps our silverware storage blend right in! Super easy to clean too. Would recommend. Perfect! Bought for an annual get together. It is sturdy, and holds a lot of flatware. I used the 4 bin for napkins and straws, it worked well. Best thing is I can clean it out after and refill minus the napkins and wrap in plastic for the next event. Ready to go. This is a very good cutlery box and is ideal for cafes like ours which we use to store our cutlery. It is very sturdy. This cutlery box is the perfect size for most applications and is made of a very strong plastic. They clean up well and stand up to repeated use. Heavy duty plastic to hold silverware and napkins in my snack shack. Holds almost 200 soup spoons and 200 forks! Great product and couldn't ask for a better price! I purchased two of these to store and haul metal flatware for catering. They are very spacious and heavy duty. I am happy with the purchase and will buy again when needed. Bought this item for an addition to our server station to help with clutter and space issues. Doesn't have to be used for just silverware, put whatever you need in it to free up some space. Ordered these when I had a served dinner for 5 hundred , I was able to fill them with salad fork, dinner fork, knife, and spoon and just take from table to table and set the places. Excellent quality product for the low price. I would highly recommend purchasing this space saving product. Fits a ton of cutlery, is nothing fancy, but all you need. Black is sleeker than gray and this one seems durable and thick. Easily washable. Holds all of our utensils. I enjoy this product a lot. This is a fantastic cutlery box. This thing is super large and will hold a ton of cutlery or kitchen utensils of various shapes and sizes. Item works as intended. Great way to store and carry silverware. Doesn't take up too much space and is light weight. Cleans up very easily and looks attractive. The first thing you will see after you receive this, is its amazing quality! I would highly recommend this product. It is a little bulky, but we'll make it fit somewhere. We use these products for multiple applications. We use them for holding silverware as well as holding our condiments. It is perfect for holding salt, pepper, ketchup packets, and crackers. These came in so handy. This is a great item and I am glad I ordered it, The shipping was fast and customer service is awesome. This is a very roomy box that can handle all sorts of silverware, cutlery, and other cooking utensils. It is very easy to clean and is durable. Still looks brand new after all this time. the perfect caddy to keep all the cutlery in the same place while keeping them organized. the product is made from strong durable plastic and will last a long time. This is a great size to hold all of your flatware. It is a nice sturdy container and each compartment is a good size. I would purchase again. This 4 compartment cutlery box is durable, cheap, and easy to clean. Will be buying another one to hold all my measuring spoons and cups and other miscellaneous kitchen tools. Great for receptions or church pot lucks. Wrap silverware and place in compartments or simply place the knives, forks and spoons in their own space. They stack pretty good too so they don't take up much storage space. I can not believe how great the price is on this cutlery box. We needed something to hold the utensils in our restaurant and this works perfectly. We needed a silverware holder for my restaurant. The silverware holder was affordable, large, and good quality. We are pleased this this purchase and would buy again. Bought this to try to get some organization in our life. This tray is sturdy and does its job well. I wish we would have bought this sooner. Pretty standard silverware holder. Works as expected. Actually thought we would use this more but ended up just keeping our silverware in the drying rack until rolled. I use this product for different use.As a condiment and silverware holder.it's a very good product and it holds so much in it. IT'S Worth every penny. Great for loose silverware before it is rolled or stacking rolled silverware. It can also be used for carry out cutlery. They are easy to clean and love anything dishwasher safe! This four compartment cutlery box is a hardy piece. Well made with thick durable plastic and has nice and deep compartments. We are happy with it. I have to say that while these are a good price, and they look better than the light gray boxes we had previously, they are not durable at all during the shipping process. Some of the boxes in my order literally shattered on the corners, and the edges were quite sharp for plastic. Webstaurantstore was great with replacing the damaged ones, but in this case I think I'd trade a higher price for better durability. This is a very versatile compartment box. Can be used for more than just cutlery. Very sturdy construction and doesn't collect dust. Very easy to clean. These are great for organizing your flatware in your commercial kitchen. They are durable and easy to clean. However, they begin to rip if overloaded with too much weight. Sturdy, well built and a great value buy for sure. Hold all our silver we have and knives too! We will probably get a few more soon too. Nice cutlery box. It is nice to be able to get a black box instead of the regular gray ones. We have been using this black one to hold the wrapped flatware. The 4-Compartment Black Cutlery Box is perfect for our needs. Its easy to clean and keeps our cutlery clean and organized. It is defiantly worth the price. Good cutlery box. I plan to use it to transport my cutlery to an event and then refill with the dirty cutlery, wash, refill with clean cutlery, cover with film and wait for my next event large enough to need a ton of cutlery. Very sturdy! Better than what I have imagined. The compartments are big and can hold a lot of flatwares. Very satisfied with this product and the price is just unbeatable. This cutlery box is the best deal for the money. We use to hold our flatware and works great. Very durable and clean looking. I was skeptical at first when I saw price but the durability proved me wrong. Great item for the price. Highly recommend. Great size - it can hold a lot of each variety silverware. Tough plastic construction. Does not bend with substantial weight inside it. Easy to clean in dishwasher; no worry of warping. I have made great use for this with all my silverware along with storing other things. Very easy to keep clean an has held up very well. Great product. This cutlery box is easy to clean, holds a lot of silverware, blends into shelf, is very durable, and worth the money. Exactly what we were looking for. Extremely sturdy and durable, does not bend under heavy weight as so many other similar products do. Was skeptical about the durability because of the low price, but it is better than any other more expensive compartment boxes I have purchased. Perfect for what I needed it for: this box holds the cutlery for the studio parties and other events. Strong but not brittle... so far. Durable, affordable and easy to clean. This cutlery box is the perfect solution for silverware storage. We will purchase again when the the need arises. These cutlery boxes are great. They make it easy to organize and roll silverware every day. I love these boxes and would recommend them to anyone. Not as sturdy as I was expecting... I was kind of hoping that it was a bit thicker plastic and had reinforcements on the handles.. I guess this would be good for someone who doesn't move these a lot.. but as mobile chefs, our equipment gets used hard... I don't have a lot of faith on durability on this. Thank you for your review! We're sorry to hear this cutlery box wasn't sturdy enough for your applications. For a heavier duty box, try this Black Cambro Cutlery Box. These boxes have deep enough compartments to hold a significant amount of silverware and the handles are strong. Really easy to clean with smooth surfaces all around. We have uses little plastic baskets forever for sorting our utensils. What a mess! Everything in one place now! Easy to wash and durable. What more could we ask for?. I have used these in the past, cutlery boxes are a fantastic way of providing silverware to your guests; it keeps them organized and for quick retrieval for your guests. I use this item to separate my utencils from other ones, while serving several different foods. works wonders, before, we didn't have organization with the utencils. good weight, liked the color ( black) , very durable ( been dropped a few times and hasnt broken) and has a good low profile. This 4 compartment cutlery box is very durable. It is exactly what I needed. My flatware fits perfectly in here. I will be ordering a few more as we grow. This tub is made of good quality black plastic. The handles are nice, no sharp edges. It cleans nicely and fits on any 24 inch counter. This 4 compartment Cutlery Box is nice and sturdy. It is larger than I expected. It hold plenty of forks, spoons and knives. Great price for the product. This box is awesome.. Keeps all of our cutlery organized accordingly. Also is great for running all cutlery thru the dishwasher. I would recommend these for anyone who wants to get more organized in the future. This is an excellent item and is well made and sturdy. It is deep enough to hold a good amount of forks, knives and spoons. This cutlery box is great to keep everything organized. We use them to separate our kitchen tools so we can find things fast. It's well made & sturdy. Highly recommend. A great item to keep your kitchen organized and clean. They are sturdy and clean very easily by just sending through your dish machine we love them. Cheap, reliable, practical. It is designed to move silverware safely and easily, and it does just that. Easy to clean and store when not in use. Great item and great cost . For the price I believe that you really can't go wrong if you just need a practical and functional container for your silverware. These are heavy duty and constructed well. This 4 compartment cutlery box is very well made and you can not beat the price. It will hold up well wash after wash.Very satisfied. Very good item to have. Well made and you can't beat the price. You will find lot's of things to use them for but it really makes it easy for wraping flatware. We have very heavy silverware,and we load this tray right up. Easy to clean. Love the color, our colors are red, black and silver. Would buy again. Great for seperating silerware for wraping.also good for drink lids.and you cant beat the price.They are a must have for any resturant. Can't beat the price! This is an essential product for every single restaurant. Its usefulness is unmeasurable. You can easily keep all of your silverware sorted and well organized. We purchase 4 of these and when we got them, one of them was damaged during shipping. We called customer service and then sent us a brand new one right away without any hassle! The rest of them are sturdy and they are fairly big. Very happy with our purchase. The 4 Compartment Cultery Box. It is great for many uses we have two at the restraunt ,and donated the third one to the church kitchen.We use for seperating lids,and silverware.The church uses theirs for the silverware .So everyone can get what the need for the occasion.We love this idem. Great multi use item!! Of course it is perfect for storing silverware but it works nicely for holding mise en place items and even small tools!! Great for organizing. We use ours on the expo line to organize condiments and to-go items. Easy to clean. We run ours through a dishwasher. The 4 compartments keep our silverware separated, and is easy to clean. It is very heavy duty hard plastic, & has held up to daily use in our fast paced restaurant. We purchased this several months ago and use it daily. It is very, very durable. I know you can buy these anywhere, but I have searched and this is a great deal! The serving line at church was always looking for something to put the silverware in. This item allows for easy access and clean up following the event. A lot of things can be done with these containers. They are great for holding and storing silverware for service. They are durable, strong and convenient. This cutlery box proves to be useful for a number of different applications. customers find it easy to reach in for utensils, it can be used for storage and transport for caterers, and more. Mine did suffer a fall and the shattered one of the compartments, but I would buy this product again and recommended it. I bought this similar cutlery box from another vender but it was too big. Finally,I found the right size from you. Thank you very much. this thing is the heavy duty version of the standard. Thick, not flimsy ate all not that you could tell that by the price. buy it your gonna need one. this 4 compartment cutley box is just that and a whole lot more. we have three of them at our restaurant and they are in constant use. I have two of these for my business. Theyre used mostly for storage and quick sorting, before silver gets rolled. Great price, and has lasted the test of time. I ordered 2 of these for the school cafeteria and I just love it! The plastic is so sturdy and durable that it definitely will keep for a long time. 4 compartments are great for serving utensils for the kids. it is a very good product. they are made of high quality plastic and thick enough to hold those heavy silverwear. i will highly recommend it. The cutlery box is great for storing and transporting silverware to and from catering jobs. Each box holds approximately 100 pieces of silverware and are very sturdy. Excellent product and price. This is a silverware holder but can also be used as a very efficient and economical lid holder as seen in my photo. This box does the job, but it didn't withstand the 3 foot drop to the floor that shattered it. I would however buy this item again. This product is a basic essential. I use it to hold plasticware at the beginning of our buffet line. This tough and sturdy cutlery box will last many years. I bought this to use at informal family gatherings, it holds alot of silverware. It's convenient and so easy to use with either regular or plastic silverware. prices are lower then the local stores, I will keep on shopping as longe as there is a good value.